I was going to do this post later, but I got so many requests for the recipe and detailed post ever since I posted the preview images on FB group that I decided to do it earlier and push the post planned for today. SO all you HBG members, here is the recipe and detailed instructions for making pizza at home from scratch. When I first thought of making pizza, I kept postponing it. Why? Because I fear the unknown. 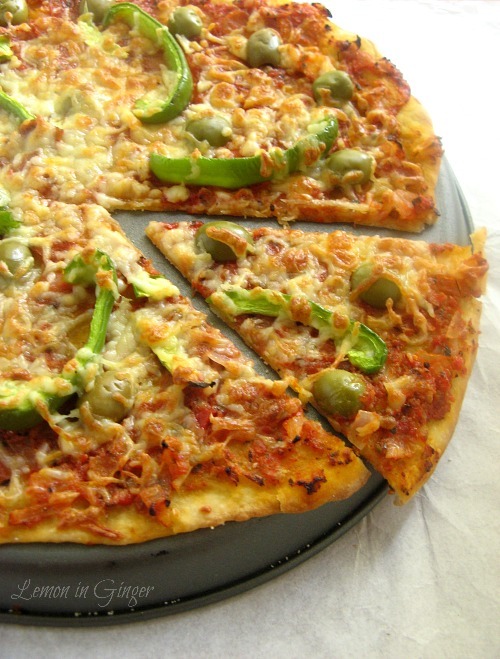 How can I make pizza at home? There must be special techniques/ pan/ equipment required. It can not be that simple. These were few of my thoughts. Peter Reinhart’s recipe has been touted as the best across blog-o-sphere and I was influenced, to say the least! Since I do not own his book, I chose to go with Heidi’s detailed instructions and recipe. 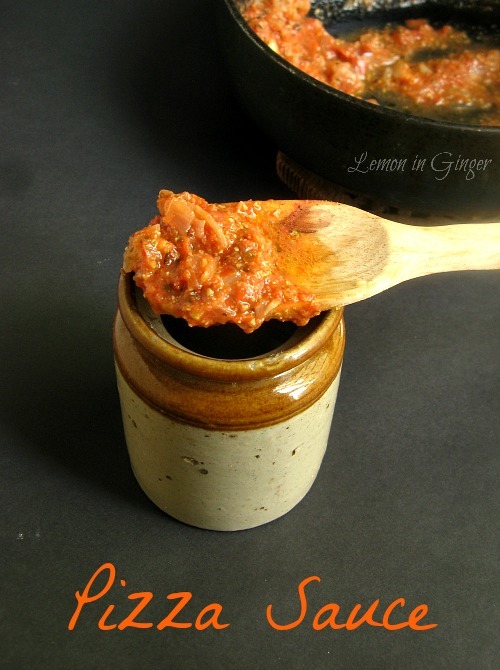 If I am making the pizza, I had this niggling thought, why not make the pizza sauce at home? Why not jump in, why test waters only? 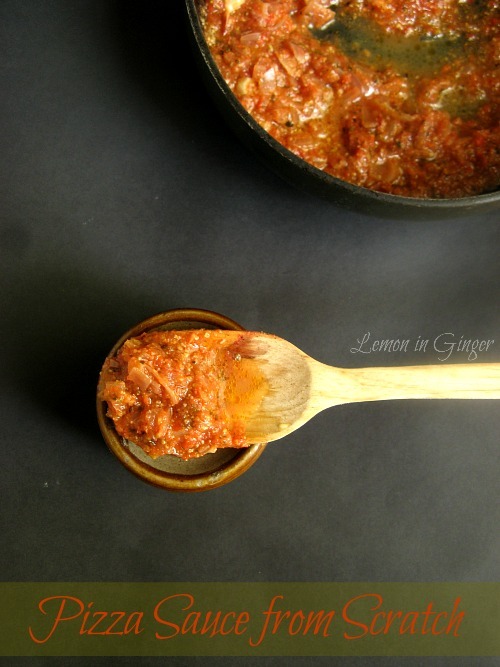 So came across the recipe for sauce at home, on food network which had very good reviews. All in all I was set for a pizza at home. And when I started doing it I realized how simple and easy it is. The dough is pre-made, the sauce is pre-made. You only need to rise the dough for 2 hours before ready to roll and bake the pizza. It was a breeze. Without a pizza stone. You don’t know what it is? Even I don’t know? I sent kid and V to school and office respectively and set about rising the dough. After 2 hours, I rolled it quite easily and then was happily putting together the most scrumptious pizza I ever had. 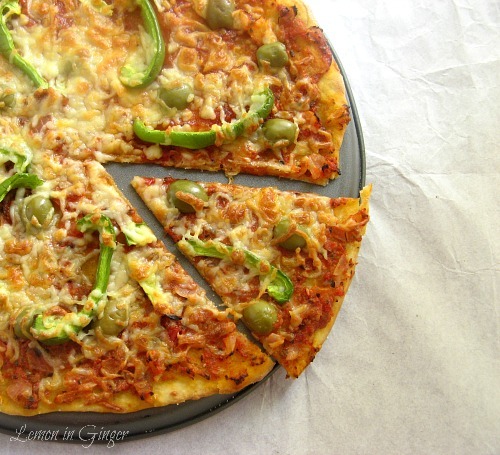 I used minimal toppings – sauce, cheese, green pepper and olives. The less the better. After the first bite I realized that this truly is the simplest, easiest, tastiest, yummiest and bestest pizza I ever had. I know bestest is no word. But I am pizza crazy at the moment so excuse me, please! I have kicked myself 100 times during the pizza making process and I am sore! I don’t have a fetish, please relax. I kicked myself for not attempting, pizza sauce and pizza at home. It is so simple. Now pizza dough is going to be a permanent feature in my freezer. A super easy and tastiest pizza. The dough is quick to come together and frozen for future use. 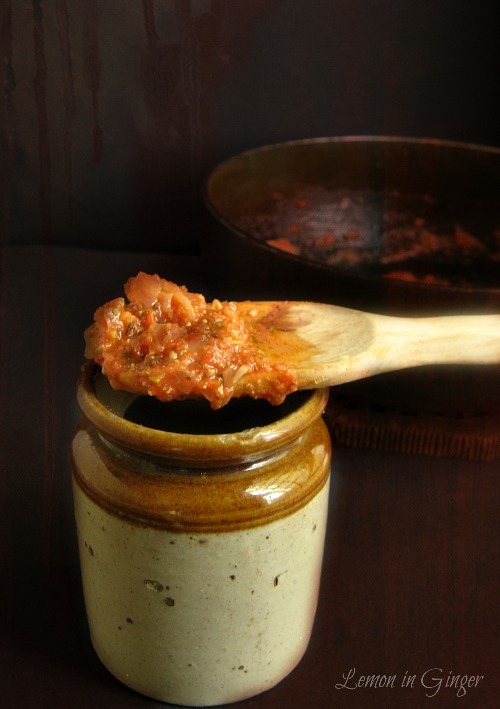 The sauce can be pre-made and refrigerated. It just takes 15 minutes to roll and bake the pizza. In a large bowl, stir together flour, salt and yeast. Add in oil and cold water. Using a metal spoon or your hand or a dough hook, bring together the dough till it forms a smooth and sticky dough. It should take about 5-7 minutes. The dough should clear the sides and stick to the bottom of the bowl. If the dough is too sticky and doesn't come off the sides of the bowl, then add in some flour to help release the sides. If it clears the bottom of the bowl, dribble in a teaspoon or two of cold water. The finished dough should be springy, elastic and sticky but not tacky. Sprinkle flour on the counter and transfer the dough to it. Prepare a sheet pan by lining it with baking parchment paper and greasing it. Using a metal scraper or sharp knife, divide the dough into 3 equal pieces. You can divide into 2 also if you are comfortable shaping bigger pizza. Dip the scraper or knife in cold water between cuts if the dough is sticking to it. Sprinkle flour over the dough. Make sure your hands are dry and then flour them. Gently round each piece into a round ball. If the dough sticks to your hand, dip your hands in flour again. Transfer the dough balls to the sheet pan, mist them generously with oil and slip the sheet pan into a zip-lock bag. Put the pan into the refrigerator overnight to the rest the dough. You can keep it in refrigerator for upto 3 days. At this point you can store these dough balls for future baking. After rounding each ball in above step, just coat them liberally with oil and transfer each ball in a separate freezer bag. Store in freezer for upto 3 months. Transfer the desired number of balls to the refrigerator the day before you plan to make pizza. On the day of making pizza, remove the required number of balls 2 hours before making the pizza. Dust the counter with flour, and then mist the counter with spray oil. Place the dough balls on top of the floured counter and sprinkle them with flour. Dust your hands with flour. Gently press the dough into flat disks about 1/2 inch thick and 5 inches in diameter. Sprinkle it with more flour and mist with little spray oil. Cover with loose plastic wrap or a ziplock bag. Let it rest for 2 hours. Pre-heat the oven to 250 C as most home ovens don't go beyond this. If yours have higher setting, go for the higher setting. The oven should be as hot as possible. Generously dust the back of a sheet pan with semolina flour or cornmeal. Make the pizzas one at a time. Generously flour the counter with flour and using a rolling pin roll the pizza. Keep re-flouring the counter or rolling-pin if required. If you are having trouble extending the dough outward, let it rest for 5-20 minutes, to let the gluten relax and then try again. When the dough is stretched to your satisfaction (about 6 to 9 inch for 1 dough ball), place the rolling pin on one edge of the rolled dough. Slowly wrap the pizza dough onto the rolling pin while rolling it from one end to the other. Now take the rolling pin with pizza dough wrapped on it to the prepared pan and lay it on starting with one edge and slowly rolling it in reverse direction of the wrapped dough so that it unrolls easily. Make sure there is enough semolina or cornmeal to slide it off. Lightly top it with sauce and pizza toppings of your choice. Place the pan into the pre-heated oven and bake for 5-15 minutes depending on how hot your oven is. 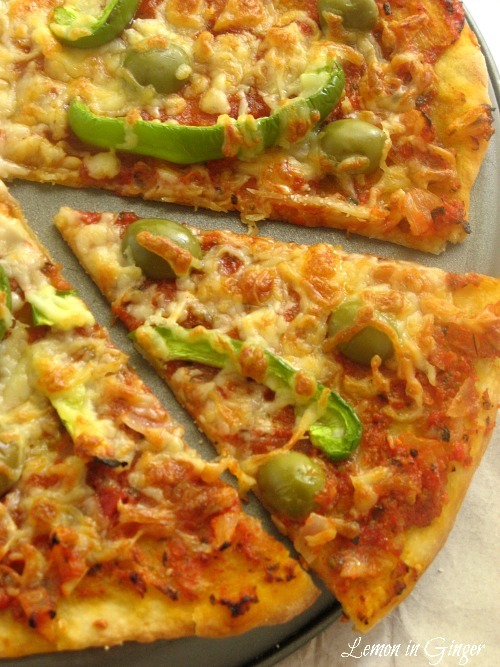 The pizza doesn't take long to bake, so keep as eye and as soon as it is baked and cheese caramelizes. Rotate the pan if required for even baking. If the top is done faster than move the pizza to the lower shelf or vice-versa if the base crisps before cheese caramelizes, then move it to higher rack for baking. Remove pizza when done from oven and slide off the pan onto a cutting board. Allow the cheese to set slightly for 3-5 minutes and then slice and serve. Enjoy pizza from scratch. 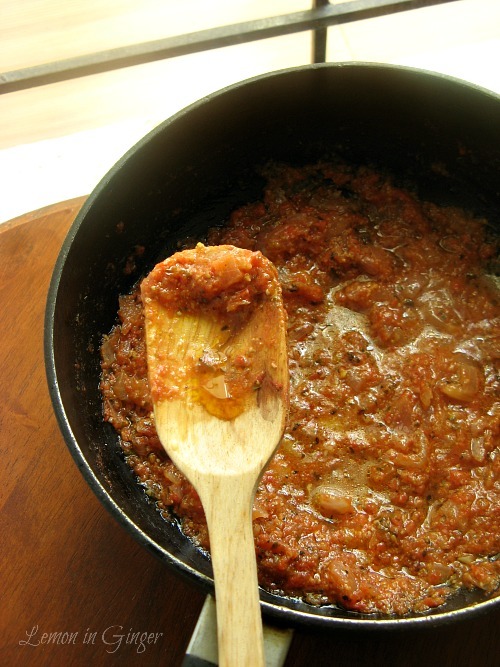 Remove the bayleaf and spread the sauce on the prepared pizza dough. Using olive oil in the dough is optional, but it is recommended as it gives a moist and supple dough. You can mix the dough using a paddle attachment on low speed. If you are mixing by hand, try copying a vigorous motion of a dough hook, while rotating bowl in circular motion with the other hand. Reverse the circular motion few times to develop gluten further. If you are using electric mixer, then change to dough hooks and do it for 5-7 minutes on medium speed or till the dough comes together as smooth and sticky. Repeatedly dip the metal spoon, hand or dough hook in cold water during the dough process. You can use the traditional method of rolling the dough for pizza using your knuckles as described by Heidi. I have not attempted it. My pizza was done in 12 minutes. So keep a careful eye on your pizza.